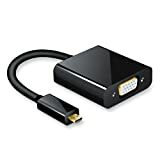 — Connecting Mini DisplayPort port compatible with Laptop or Tablet PC to HDTV, monitor, or projector with HDMI/VGA/DVI port.Transmits both audio or video from Laptop or Tablet PC to HDTV display. — Lightweight and portable adapter,length approximately: 0.2 Meter. — Gold-plated connectors resist corrosion, provide rigidity, and improve the signal performance. — Supports video resolutions up to 1080P (1920*1080 Full HD).Supports HDMI 225MHz/2.25Gbps per channel (6.75Gbps all channel) bandwidth. Supports HDMI 12bit per channel (36bit all channel) deep color and compressed audio such as DTS Digital, Dolby Digital and uncompressed audio such as LPCM . — Mini DP to HDMI / DVI / VGA Adapter, 3 in 1 Hub Cables are available in stock. Golvery is established from 2012 and we are focusing to Design and manufacture convenient and fashionable products and adhere to quality as our mission. 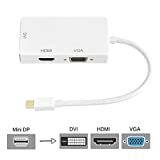 This Mini DisplayPort(Male) to HDMI/VGA/DVI(Female) hubs enables the connection of your Mini DisplayPort supported Laptop or Tablet PC to HDMI/VGA/DVI supported HDTV, Monitor or Projector. — Input: Mini DisplayPort Male. — Output: HDMI/VGA/DVI Female;One separate HDMI / VGA /DVI cable is require. 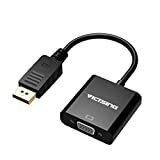 — Can only convert signal from Mini DisplayPort to HDMI / VGA / DVI. This is not a bi-directional adapter. — No driver installation required. — No audio output from VGA and DVI and do not support 4K*2K . — Audio output can be enabled for Apple Mac released in the mid of 2010 and later. ✓ Apple MacBook, MacBook Pro,MacBook Air,iMac,Mac mini,Mac Pro. ✓ Microsoft Surface Pro/Pro 2/Pro 3 for Windows 8 Pro (NOT Surface/Surface 2 for Windows RT). ✓ Lenovo ThinkPad X1 Carbon, X230/240s, L430/440, L530/540, T430/440, T440s, T440p, T530/540p, W530/540, Helix. ✓ Dell XPS 13/14/15/17, Latitude E7240/E7440, Precision M3800. ✓ Cyberpower Zeusbook Edge X6-100/X6-200. ✓ Toshiba Satellite Pro S500, Tecra M11/A11/S11. 1 * 3 in 1 Mini DisplayPort to HDMI / DVI / VGA Hub,Male to Female(0.2M). — Every one of our products is personally inspected for quality. So click the ‘Add to Basket’ button NOW and experience Golvery Mini DP Adapter Cable – 3 in 1 Mini DisplayPort to HDMI / DVI / VGA Hub right now!